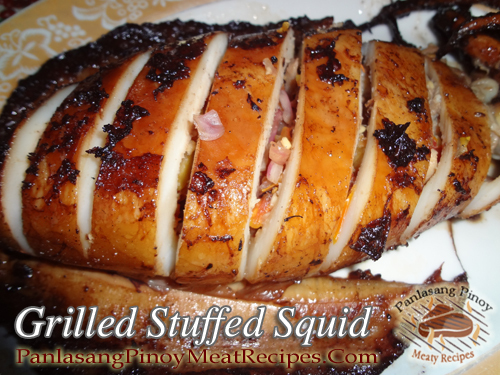 Grilled stuffed squid or inihaw na rellenong pusit is a dish of marinated squid stuffed with onions and tomato mixture then grilled over live charcoal. 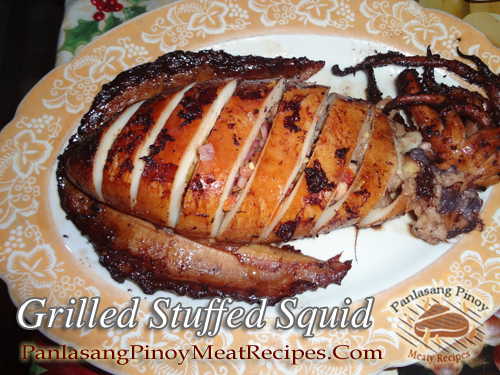 Actually you can cooked this squid without putting any stuffing because the marinade is already flavorful. You can use medium size squid if you can’t find large squid which I think is easier to cook because grilling a large squid takes longer and sometimes the stuffing is not well cooked. And as for basting, using a little cooking oil or butter will prevent the squid from becoming too dry while grilling and will also taste better. Thanks for sharing this! Mine turned out great, just added ground pork and cooked it over an oven toaster for 30 mins. but I followed the rest from your recipe. Thanks for sharing it! Hi Jen, I’m glad to know that it worked in an oven toaster. Thanks for your comment!